Henry White, known as Harry, was born 18 April 1886, at The City of London Lying in Hospital, City Road, Holborn. His early years were in Barnsbury, Islington although his parents were Yeovil born & bred, Henry White (b1858) and Alice Coates (1860-1900), married at St Saviour's Battersea, 23 Dec 1883. (His father, Henry, was the nephew of Henry White the cabinet maker and was also a cabinet maker himself). Harry White grew up in Yeovil with his grandparents, Alfred & Emma White, from about 1891. He went to Reckleford School from 1894, and was then apprenticed as a draper with Mr West of Middle Street. In the 1911 census he was visiting his aunt, Sarah Cridland (sister of the builder Samuel Cridland) in South Street, giving address as Russell House, High St., Balham S.W. Harry enlisted at Barnsbury in early 1915 and initially served in the Hussars, Service Number 15904. 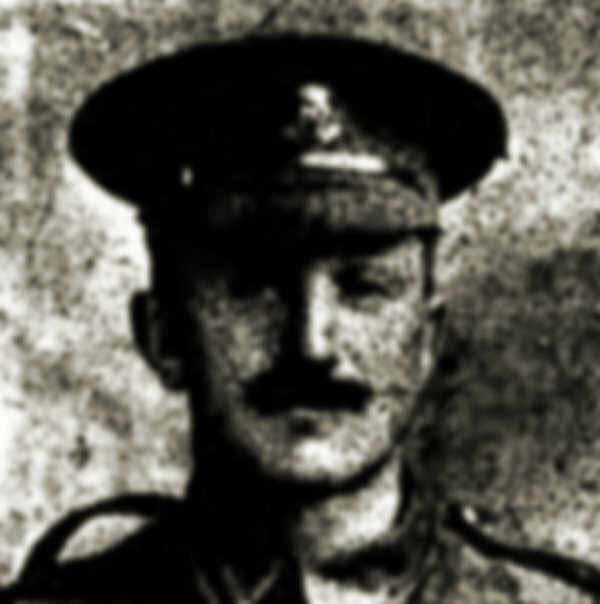 But he then served in the 2nd Battalion, Royal Irish Regiment, rising to the rank of Sergeant in August 1916. His Service Number was 8640.. The 2nd Battalion, Royal Irish Regiment saw an incredible amount of action during the Great War but it is not really possible to determine which actions Harry White was involved in. 2nd Battalion was in Devonport serving with 8th Brigade, 3rd Division when war broke out in August 1914. They proceeded to France, landing at Boulogne on the 14th of August 1914. They saw action in the Battle of Mons and the rearguard action at Solesmes, the Battle of Le Cateau, the Battle of the Marne, the Battle of the Aisne, at La Bassee where the Battalion suffered very heavy losses near Le Pilly with many troops taken as Prisoners of War. On the 24th of October 1914 what remained of the 2nd Royal Irish transferred as Army Troops to Lines of Communication. Reinforcements arrived over the winter and on the 14th of March 1915 they transferred to 12th Brigade, 4th Division. they fought in the Second Battle of Ypres and on the 26th of July 1915 they transferred to 11th Brigade still with 4th Division. On the 22nd of May 1916 they transferred to 22nd Brigade, 7th Division and were in action during the Battles of the Somme, including the Capture of Mametz, the Battle of Bazentin and the attacks on High Wood, the Battle of Delville Wood, the Battle of Guillemont and the Operations on the Ancre. On the 14th of October 1916 they transferred to 49th Brigade, 16th (Irish) Division. In 1917 we can be sure that Harry took part in the Battle of Messines with the 2nd Battalion. The 2nd Battalion, Royal Irish Regiment, including Harry White next saw action in the Battle of Langemarck. Lasting from 16–18 August 1917, was the second Allied general attack of the Third Battle of Ypres. The battle took place near Ypres in Belgian Flanders on the Western Front. The Allied attack succeeded in the north, from Langemarck to Drie Grachten ("Three Canals") but early advances in the south on the Gheluvelt Plateau were forced back by powerful German counter-attacks. Both sides were hampered by rain, which had a greater effect on the British who occupied lower-lying areas and advanced onto ground which had been frequently and severely bombarded. Henry was killed by a shell while waiting to be relieved in a support trench during the second day of the battle, 17 August 1917. He was aged 31. On 31 August 1917, the Western Chronicle reported "Sergt. Harry White (Royal Irish Regiment), brother of Mrs Whensley, of 18 South Street, who was formerly in the employ of Mr HF West, draper, &C, of Middle Street, has been killed in action. The deceased soldier was 31 years of age. He joined up five months after the outbreak of war and had been in France two and a half years going through several of the big battles. He was made Lance-Corporal after having been in France a few months and was promoted to Sergeant twelve months ago. The deceased soldier was very much treasured a parchment letter presented to him, which read as follows - "The Irish Brigade. I have read with much pleasure the reports of your regimental commander and Brigade commander regarding your gallant conduct and devotion to duty in the field on June 7th 1917, and have ordered your name to be entered in the record of the Irish Division. Maj.-General commanding 16th Irish Division." Writing to Mrs Whensley, an officer states - "He was my platoon sergeant, and I conceived a liking and esteem for him such as I had for few men. The men would have followed him anywhere, and he was universally liked by the officers, not only of his Company, but of the Battalion. After coming through an action that is almost unparalleled for its intensity, he was killed by a shell whilst in a support trench waiting to be relieved. His death was sudden and painless. You have my deepest sympathy, and I feel that no-one can ever replace him." 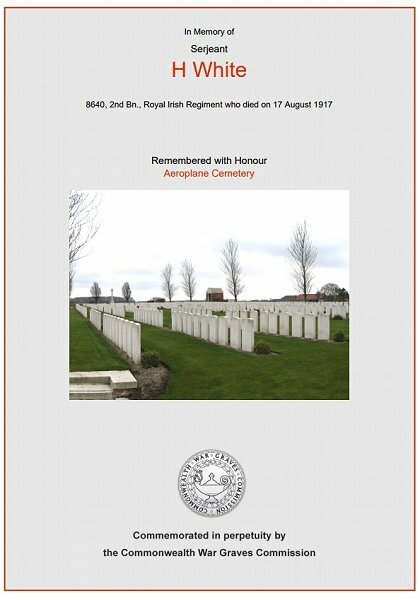 "
Henry White was interred in Aeroplane Cemetery, West-Vlaanderen, Belgium, Grave I.A.1 and his name is inscribed on the War Memorial in the Borough. Many thanks to Rose Cowl for supplying information on Harry's early life. 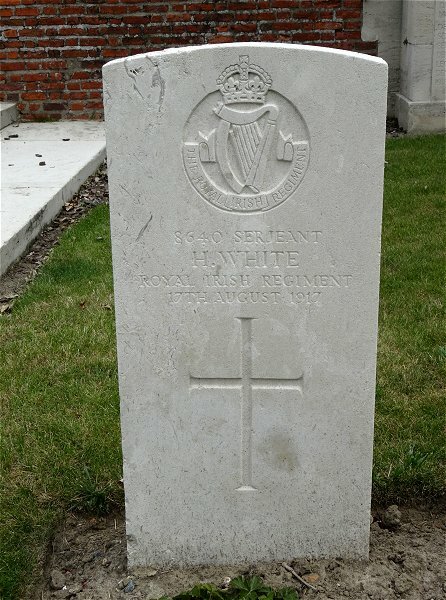 Sgt Henry White's CWGC headstone at Aeroplane Cemetery.